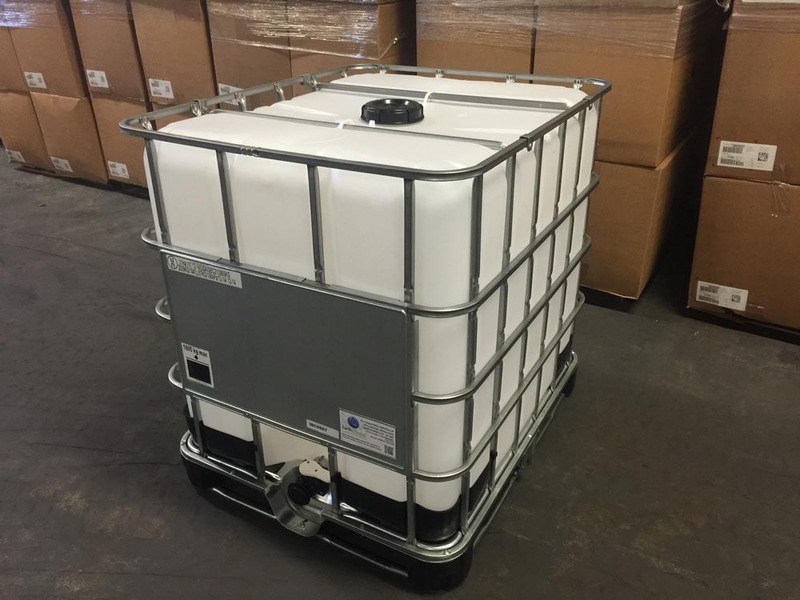 Home » combination packaging » Looking for an IBC – Intermediate Bulk Container? The inner receptacle is extrusion molded High Density Polyethylene. The cage material is welded tubular steel. The top closure is a 6 inch cap. The cap and plug material are HDPE. The gasket is EPDM, no vent. The discharge is 2″ NPT polypropylene ball valve, EPDM gaskets. The pallet is steel, 4-way entry. The UN rating is UN31HA1/Y/. There are two large marking plates, one on the front and one on the back. The plates (shown in the picture) allow for a maximum labeling surface. This IBC has extreme chemical resistance, advanced stability for increased stacking strength, and compliance in pertinent regulatory certifications. It offers a universal design to meet industry standard as well as a proven state of the art manufacturing process and patented valve compatibility. It is efficient, safe and rugged, ideal for shipping bulk quantities of hazardous and non-hazardous products.